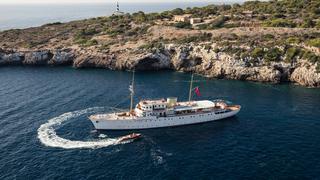 The 65-metre superyacht Shemara has been successfully relaunched after a three-year, one million man-hour rebuild project. 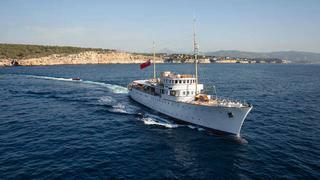 Originally launched by JL Thornycroft in the UK in 1938, the classic motor yacht Shemara led a colourful life in the public spotlight under her original owners, industrialist Sir Bernard Docker and his wife Lady Norah. Sold at the end of the 1960s, her second owner cruised her for a short period before berthing her in Lowestoft, UK, where she remained largely forgotten for the better part of three decades. Her third owner saw her in the pages of Boat International magazine in 2007, went to see her and instantly fell in love. It was the start of a seven-year journey to bring her back to her former glory. Shemara was towed to Portsmouth, UK, and hauled out in October 2010. Her new owner set up Shemara Refit LLP to be run by friend and business partner Peter Morton, who then set about recruiting naval architects from BAE along with several subcontractor companies, including Burgess Marine for the mechanical and structural elements, SEC Marine for the electrical installation, Design Unlimited for the GA and Studioilsa for interior design. The ensuing project – lasting three and a half years and taking one million man hours – has seen her reconfigured, refreshed, and largely rebuilt. The result is stunning, retaining her original character but with far superior spaces both on deck and within, and with all mod cons added – including a Rolls-Royce diesel-electric drive train with twin azimuthing pods aft instead of conventional shafts. 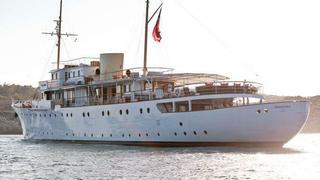 As one of the largest private yachts in existence when launched, Shemara epitomised the glamorous lifestyle of the rich and famous. Restoring her to her former glory would prove to be a serious undertaking, but the rebuild has been done sympathetically, retaining the elegance and charm of the original both inside and out while reconfiguring the interior and deck spaces for modern living. ‘As the boat started to come apart, the level of shell plate renewal and core engineering required for the refit became quite apparent,’ says Nick Warren of Burgess Marine. Much of the steel plate on the hull was rotten, as was the entire stern section. She was meticulously rebuilt using as much of the original steel plate as possible, but with a new underwater profile to aid stability, add a keel and a bulbous bow, and to allow for the azimuthing drives aft. The superstructure was redesigned and rebuilt in aluminium, including the old wheelhouse which had originally been built in brass. 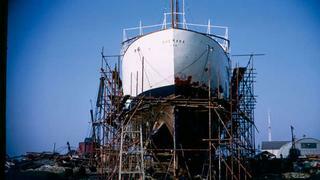 The masts were replaced with carbon replicas, and the main funnel was remade in GRP – it now houses the satellite dish. 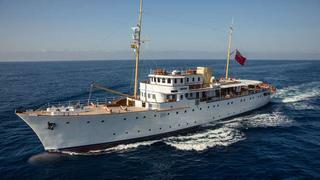 Much of the original material – including the pine plank flooring, the teak decking and the tons of brass – was reused in the rebuilt yacht. At first glance you would be hard pressed to spot the difference between the old and new Shemara – she retains the classic, gentleman’s motor yacht lines of the original with just a few tweaks here and there. The upper deck superstructure is slightly longer to allow for the generous upper saloon and day bar, but elsewhere little has changed – the main deck portholes are original, and indeed the hull from the sheerline to the waterline is the original plating. Even the new superstructure was deliberately left unfaired, giving her a real, classic ship feel. A tweak of the interior spaces and GA by Design Unlimited along with inspired interior design from the London based Studioilsa gives Shemara an extraordinary feel inside – contemporary, yet classic. 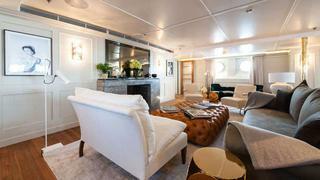 ‘The idea,’ says Ilsa Crawford of Studioilsa, ‘was to make it a home for the owner and his family, albeit a floating one. 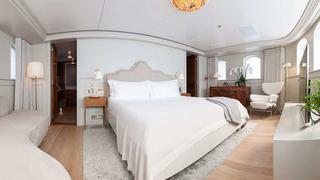 Too often the interiors of superyachts can feel more like hotels than homes.’ The esoteric mix of furniture works perfectly, and the spaces are wonderful – a giant formal saloon and dining room on the main deck, with an informal upper saloon and day bar that opens on three sides on the upper deck. Guest accommodation, comprising six double guest cabins and a larger VIP on the lower deck, and an owner’s suite forward on the upper deck, is classically comfortable. A new, grand central staircase links the decks. While Shemara Refit LLP and Burgess Marine were tackling the technical aspects of the rebuild, Design Unlimited explored the reconfiguration of the spaces. ‘We started developing the exterior while keeping all the character of the original boat, just improving the spaces without going over the top,’ says Design Unlimited founder Mark Tucker. The result is a wonderful array of deck spaces – from the observation deck atop the wheelhouse, to a large sunbathing area aft on the bridge deck, an expansive aft deck with plunge pool on the upper deck and an alfresco dining area on the main deck aft. 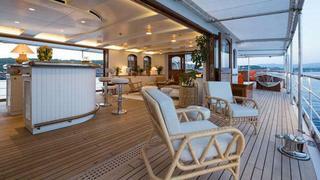 The sidedecks – particularly on the upper deck – are wide, and reminiscent of the promenade decks of classic liners. The key change was the installation of the Rolls-Royce diesel-electric system. 'She’s quite a low volume yacht to put that equipment in,’ says her current captain, Julian Spier, ‘but the key selling point from the owner’s perspective was the quietness of the system. It’s also efficient and there’s a lot of redundancy. It gives great manoeuvrability and it also allows for a dynamic positioning system.’ The system comprises five main generators that can supply anything from 300kW to over 1600kW depending on mode. The azimuthing pods and new bowthruster allow her to turn almost in her own length. Cruise speed is around 11 knots, with a maximum just over 14 knots.